With summer coming to an end, I find myself looking back and reflecting on those most memorable of summer evenings. You know the ones I mean; full of warm summer air, sunsets that never seem to end, where those distant days (months) of grey winter chill seem to have never even happened. Our Summer Rooftop Party was definitely one of those nights. One of my favourite parts, and definitely the most popular stall, was our Laksa Noodle Bar. 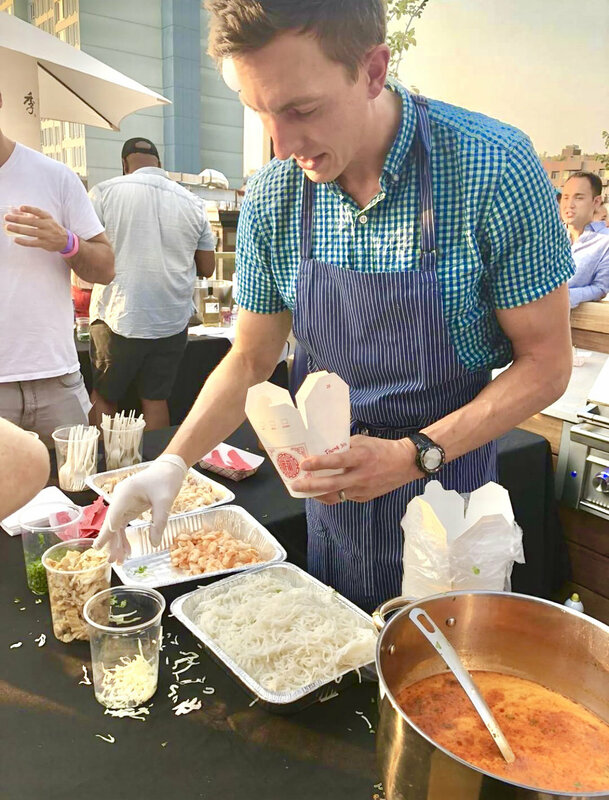 We had scores of people lining up to grab a bowl of delicious, spicy broth, topped with prawns (or shrimp), chicken and a healthy pinch of cilantro. It was the perfect dish for a balmy summer evening (the more you sweat, the cooler you get! ), but I also think this dish has a place throughout the fall and winter, warming you from the inside out. With the help of a good Laksa paste, this dish is a breeze to whip up any time of year. Heat the oil in a large pot over medium-high heat. Add the laksa paste and fry until it becomes fragrant and absorbs the oil. In a separate pan, fry the chicken until cooked and set aside. Add the coconut milk and chicken broth, and bring to a boil. Then add the tofu puffs, reduce the heat to low and simmer for 10 minutes. In the meantime, pile into a big soup bowl a handful of rice noodles, bean sprouts, a couple of cooked shrimp and some strips of chicken. Ladle some of the hot broth and some tofu puffs into the bowl, and add any additional toppings that strike your fancy (we love tofu puffs, cilantro leaves, Sambal paste and thinly sliced curry leaves). *You can also substitute roasted chicken for ease and flavour.